Favorite wines from Trader Joe's? Please share your favorite wines from Trader Joe's. I like Trader Joe's Wine Shop because I am cheap, but I know nothing about wine and usually just grab a couple random bottles. I'd love to hear what others think are the best price/quality wine values at TJs. I'm not a fan of white wines but every time I stop in TJs I buy a bottle of Lambrusco Dell'Emilia Bianco. Oh so yummy! I'm not sure if selection depends on your location (or varies significantly over time), but here in New York I often keep an eye out for a wine called Big House Red. I think the same company does Big House White, Big House Rose, etc, and may have a few other wines as well. They're usually very simple but drinkable blends at a good price. I've been getting the Big House Red for years and it's consistently lovely. It's hardly something I'd bring to a fancy dinner party, but it's great for pasta night or barbecues, or just to have around the house. 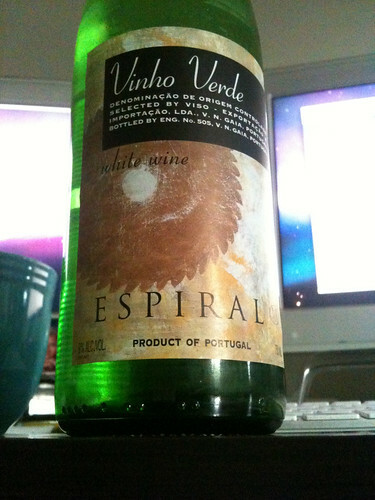 Their Vinho Verde is also awesome - perfect for Mexican food. Wine is a very personal thing. Do you know what you like, or what you dislike? Have you done any casual wine tasting, comparing different vineyards or classifications? It's fun, and would be a great way to hang out with friends and figure out what you might look for in the future. While it helps to have some training in how wine is made, the different factors that change taste and whatnot, you can learn a lot by tasting slowly. Don't pour full glasses on the first go - smell and taste a bit of one bottle, talk about it, smell and taste again. Eat a bit of bland cracker, try the next. Write down what you're thinking, maybe even before talking about it. After a while, you'll know more about what you like, if not the process that makes the grapes into delicious (or less appealing) wine. I like the Toasted Head Chardonnay a lot. Whenever I'm down in the States I try to stop by a TJ's to pick up a couple of bottles (max allowed over the border without paying outrageous duties). There's a cab that has a lovely lady sitting on the front. It looks pretty art nuevo, and she has a bunch of grapes tattooed on her arm. It's called Liberte, and I'm pretty sure that it's rebottled Coppola. One thing that you should be on the lookout for are the yellow hang tags. They indicate that a wine has been specially bottled for Trader Joe's, which mean they're about half the price of whatever name brand wine they're standing in for. You're pretty sure to get a tasty wine if you steer away from the white labels and try the yellows. blackcatcurlouser are you me? Seconding the Montepulciano D'Abruzzo and the Vinho Verde. The latter has a fairly low alcohol content, but is most delicious on a hot summer day. I think this particular Montepulciano is like $4.99 or $5.99, and the Vinho Verde is $3.99, if memory serves. The Cleveland-area Trader Joe’s stores stock this great Hungarian red wine whose name escapes my Indo-European-mind at the moment for $9. The label is white with tall serif lettering. My TJ's used to have a cheap red called Falcon Ridge (I think). It was around $5-6. I haven't seen it in a while, so I am sad. I too like finding the good (decent) cheap stuff. I also don't mind the house brand Sauv. Blanc but I am not any kind of wine snob at all. They carry an Amarone that is superb, seriously the equal of wines many times the price. On the other end of the spectrum, the white Lambrusco that someone mentioned abovethread is really tasty on a summer evening. It's $5 and lightly sweet and fizzy and low alcohol, and a treat with food that's inappropriate for dry wines. I serve it when I make blintzes. the south african pinotage (unique to south africa!) -- it has a giraffe on the label! I think stoneweaver is talking about this one with a gypsy on the front. I've heard that it's really very good. (I don't drink, myself, so I really can't say.) And it's definitely cheap. The Marques de Caceres Rioja is excellent. There are actually several varieties of the Montepulciano D'Abruzzo. Both the Tommolo ($5.99) and the Villa Cerrina ($3.99) are good wines for the cost. If you want to narrow down your particular taste in wine I could offer more specific suggestions. Not that one, phunniemee. Although, I can also recommend it! It's pretty tasty. There are some websites where people are fairly methodically drinking their way through Trader Joe's and writing reviews. But I always forget to take a look before I go there and pick randomly. The reviews on Trader Joe's Wine Compendium seem pretty good. I've found a number of good reds that way. One caveat is that much depends on your location and the store's wine buyer. There are several TJs in my area. Their stocks overlap, but not all stores carry all wines, and some of the ones reviewed in the Compendium seems to never make it out of the Pacific Northwest. Spiral Wines Cabernet Sauvignon Napa Valley 2009. Black label with image of a silver baroque tree on the label. Very plummy, full bodied, rich wine - wonderful! I forget the price, not over $12 (the linked to article above lists it for $5). Liberty School is the best Cabernet under $30. Should be $12-14. The wife and I have been into cab sauv lately and will second the recs for Liberte and Spiral Wines. But for us, the best quality/value combo is a Chilean carmenere from Panilonco. The '09 is a fantastic any-night-of-the-week wine, and is only $4-5 a bottle. The Oreana '?' that I got from one of the Atlanta TJs is an awful lot of fun -- really nicely balanced, which is what you want from a blend -- and at $10, it's a steal. I think their Old Moon Old Vine Zinfandel is pretty reasonable for the money. If you're in California (and they still carry them) I remember really liking their Castoro wines. Smooth, yet powerful -- nice balance. Being very cheap, I've really only tried the Charles Shaw wines and didn't much like the Cabernet Sauvignon or the Merlot. However, the Shiraz was absolutely wonderful and only $3 (maybe less other places but $3 in NYC). The Blue Fin wines I've tried (a shiraz and a viogner) have been rather tasty $4 bottles of wine. For a few more dollars, the I think Emergence (there's a white blend and a red blend) are both really great $7 bottles of wine (a splurge in our house!). The Trader Joe's reserve Pinot Gris is also tasty $6 bottle. I seem to recall enjoying assorted La Finca reds, though it's a been a while. My old local Joe's carried a prosecco that came in a plain green bottle with an oval label that just read "Prosecco." It's cork was tied with string, too. And it's delicious. I also like Goats Do Roam, which is a cotes du Rhone blend that is cheap and tasty. Oh, how I miss wine in grocery stores. Silly state I now live in. I got a bottle of Evenus port-style Zinfandel there that was delicious! Sangre de Toro with the cute plastic bull attached at the top. They have a fantastic almond 'champagne'. I can't recall the name but they don't have many sparking wines so it shouldn't be too hard to find. The little pig is flying because it expresses a song which the Spanish children sing when somebody has asked for something which is impossible to realize, has a dream or says something absurd. It's not overly dry and is about as thoroughly inoffensive as it's possible to be at under $5. I will definitely buy again. Good straight out of the bottle, no decanting needed. Trader Joe's Reserve wines - we've had a couple of nice reds from this label. Wild Horse 2008 Pinot Noir. Greg Norman 2008 Cabernet Sauvignon.